LOS ANGELES – To a boxing fan who closed his eyes and listened, it almost seemed like it was 1986. 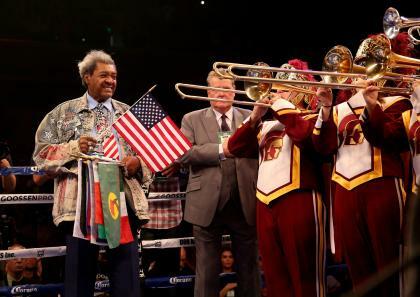 Don King is, once again, the promoter of the heavyweight champion of the world, and no one within three blocks of the Galen Center on the USC campus Saturday could have missed that. He talked of going on world tours and solving social issues such as women's rights and racism while for nearly 20 minutes, ignoring the man seated to his left who had just won the WBC heavyweight title. Bermane Stiverne knocked Chris Arreola down twice and then stopped him in an extraordinary performance to claim the title that Vitali Klitschko vacated in December to enter politics in the Ukraine. Stiverne gave thoughtful, almost soulful, comments at the post-fight news conference after the biggest night of his career. At one point, tears streamed down his cheeks as he spoke of his brother and then of his relationship with his manager, Camille Estephan. "My manager, Camille, I don't know whether he's an angel or Houdini, but the relationship I have with him, is more than business. Before I came to him for help, we had a good friendship. One day, he just came down to talk about my career. When I asked him for some help, there were people who told him I was a waste of time. "But he still believed in me. He did things he was not supposed to do and I owe him everything. I love him like my brother. He's my manager, but I hate to call him my manager. I'd rather call him my friend." Though it took Stiverne's commitment – he hasn't had cable television in the 10 years he's lived in Las Vegas and said he's watched little on his TV over the last year other than Arreola highlights – and punching power to get the victory, this was clearly King's night. The 82-year-old promoter, who made his name by promoting heavyweight champions from Muhammad Ali to George Foreman to Mike Tyson, looked like he'd never missed a beat. He was shouting a slew of catch phrases and generally confusing just about everyone who was listening, but he got more than his share of laughs and took a few digs at fellow promoter Dan Goossen. Goossen, who promotes Arreola, and King had discussed a bet pre-fight in which the promoter of the loser would shave his head. Though King's electric hair is the most famous in boxing, Goossen is very well-coifed as well. King was asked whether Stiverne would seek to unify the belt with Wladimir Klitschko, who holds the WBA, WBO and IBF versions of the championship. "We'll talk about unifying the championships, but this all takes its time," King said. "We've got a big fight ahead of us here with this young lady, Michelle Patterson, for women's rights." When a reporter tried to interrupt to get him to focus on boxing and not women's rights, King spoke even louder. No one – no one – outtalks King when he's rolling. And he was definitely rolling. "I understand, that's a big fight," King said of a potential Klitschko-Stiverne bout. "Women are half the population and when you talk about a fight, that's a fight. It's been 400, 500 years and they still ain't got their rights. That's a real fight. "But let him enjoy this. He's like a man who's been knocked out with something good. Let him enjoy it. What I really want is to see Dan bald-headed." King's company has fallen on hard financial times in the last five or six years. Many on his staff have either retired or left him to seek other jobs and the bulk of his top fighters have moved on to other promoters. Arguably the most significant promoter in boxing history, King has been mostly relegated to bringing B-side opponents for smaller level shows. But he hasn't lost his magic. 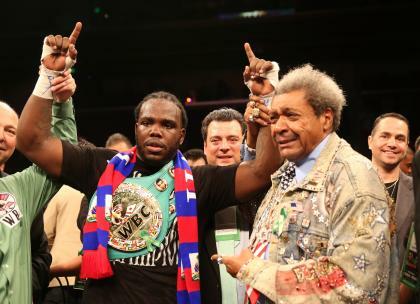 Stiverne sat quietly, an ice pack on his lip, as King rambled on, relishing the victory and the return to prominence. He screeched as Arreola praised Stiverne's fast hands. "His power is his hand speed," Arreola said. "I didn't see that punch [a right cross] coming at all. At all. I didn't see the punch coming and that's his power, man. He's so fast, but when he connects, it's like a bulldozer. He hit me and it didn't hurt me, but I was like, 'Oh [expletive]!' And I was on the ground. His main power is his speed. It's just blinding." That's all King needed, to hear an opponent building up his fighter. After shouting as if he were a preacher at a revival, "Talk to them, Chris! Talk to the people," King had to jump in. "Woooooo! Faster than a speeding bullet. More powerful than a locomotive. Able to leap tall buildings in a single bound!" King said. "It's a bird. It's a plane. He's Superman." A reporter interrupted and asked Arreola how he believes Stiverne would fare against Klitschko, who has won 20 in a row, including 17 by knockout and has held a title belt continuously since Sept. 24, 2005. When Arreola gave Stiverne a chance by saying he felt Stiverne would give Klitschko a run for the money, King was exultant. "Don't forget Lamon Brewster knocked him out [in 2004]," King said of Klitschko. "Don't go to sleep on that. That was mine, too. Lamon Brewster knocked him out. [Klitschko is a] great guy, great heart, soft chin." It was that kind of a night, like a deposed leader elevated to his former throne. The title, the only one that King ever truly cared about, and all was right in his world once again. It was a great night for Stiverne, too, who made a lot of fans with his performance during the ESPN-televised bout, then made even more with a great showing at the post-fight news conference. But King was the man of the hour and one had to be in a coma not to see it. "Tell the people that at this time, from this place, let the word go forth that the heavyweight business is back in business again," King said. Only time will tell if the division will make a comeback. It's more than overdue for one. 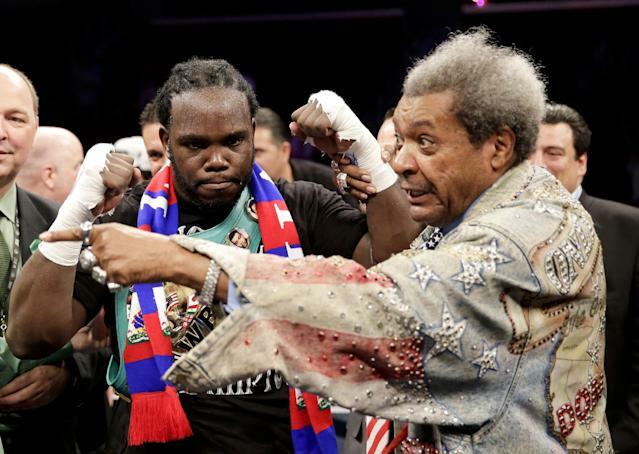 But it's plainly obvious that 82-year-old Don King is back, and he wouldn't let anyone forget it.